The artist’s own vision of Tri-Murti whose ultimate idiom and model has been represented at Elephanta Caves, an island in Arabian seas locally known as Gharapuri, some eleven kilometers off Mumbai, a territory of Maharashtra, this excellent brass-statue rendered using lost wax technique and finely grained brass revealing gold-like lustre represents Tri-Murti, the term meaning to popular mind a combined form of three major Hindu gods : Shiva, Vishnu and Brahma, and scripturally, specially as per Shaivite texts, three forms of Shiva, two of which accomplished the functions of Brahma and Vishnu and had their resemblances, and the third, Shiva’s own. Scripturally, the face on the right is one brimming with youthful vigour and feminine look representing creation and hence resembling Brahma; in Shaivite context, Shiva’s feminine form, Uma or Vamadeva; that on the left is a terrifying form representing destruction; it represents Shiva in his Aghora, Raudra or Bhairava form; and the face in the centre is a pleasant form, resembling Vishnu, and in Shiva’s context, Shiva, as Tatapurusha : the Master of positive and negative principles of existence and preserver of their harmony. 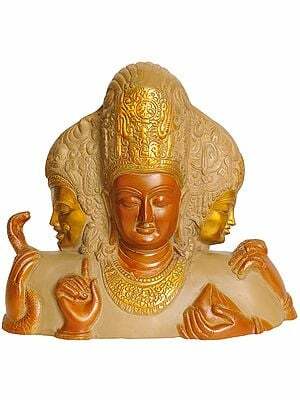 Of the two other aspects of Sadashiva : a five-faced manifestation that this form is conjectured to be, Sadyojata and Ishana, cast neither in this brass-statue nor sculpted with Elephanta model, one is presumed to be on the back, and the other, on the top. 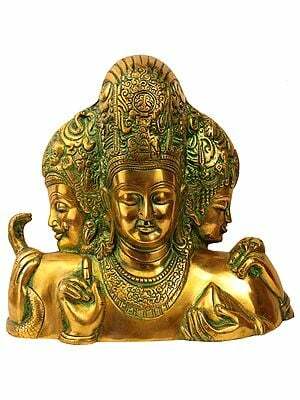 In this textual image of Tri-Murti and its Elephanta model the artist of this brass-statue has effected subtle changes so much so that it might be treated as a different image. The representation of Devi on the back, instead of an aspect of Sadashiva, is an absolutely new dimension of the image meditated neither in texts nor in any earlier models. It is for certain a product of artist’s own imagination. In the artist’s form of Tri-Murti Shiva’s own face is in the centre. Except that his decorative tiara cresting the forehead has attached to it a few skull-motifs, serpent-forms crawling on his ‘jata-mukuta’– crown of matted hair, a massive snake around his neck, and another, serving as his ear-ornaments, and a wide open third eye on the forehead, this Shiva’s face does not reveal a ‘bhava’ – disposition or bearing, of awfulness appropriate to his form as Aghora or Raudra. The iconographic vision of all three faces, with none showcasing such distinction as being horrifying, or young and youthful, or as endowed with a feminine touch, is almost identical : alike dimensions of faces with identical bearing, sharp straight noses, small somewhat sensuous lips, bold forms of eyes in meditative posture, thick eyelids and well trimmed eye-brows, except that those of the face on the right being larger. However, it is in delineating the foreheads and the style of headgears that three images have their distinction. The central face, that of Shiva, has on it a well delineated ‘tri-netra’ – third eye, and a ‘tri-punda’ mark, the characteristic feature in Shaivite line. Attached to tiara just over the ‘tri-netra’ there is a large size skull symbolising the represented figure’s role as destroyer, obviously the Shiva’s face. The other two heads, on the right and the left, have slightly narrow foreheads. 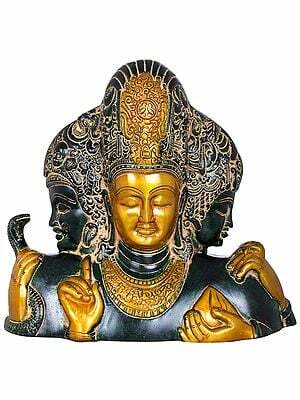 Instead of the ‘tri-punda’ these two heads have a Vaishnava ‘tilaka’ : a vertically elongated ‘u’ mark, though in these images styled like a trident. Besides, there are in both faces, above these ‘tilaka’ marks, over the tiaras, flames-like motifs symbolising energy, both, the trident and flames being essentially the features of Shiva’s iconography. Design-patterns apart, the character and bulk of neck-ornaments of the figures on the right and left are similar; however, with a large serpent and a garland of ‘Rudraksha’, a long sustaining fruit-bead considered mythically as produced by Shiva’s tear, comprising his principal neck-ornaments the central figure is completely different from the other two. The distinction of each of the three figures, as also its distinct identity, better reveals in the style of its headgear. 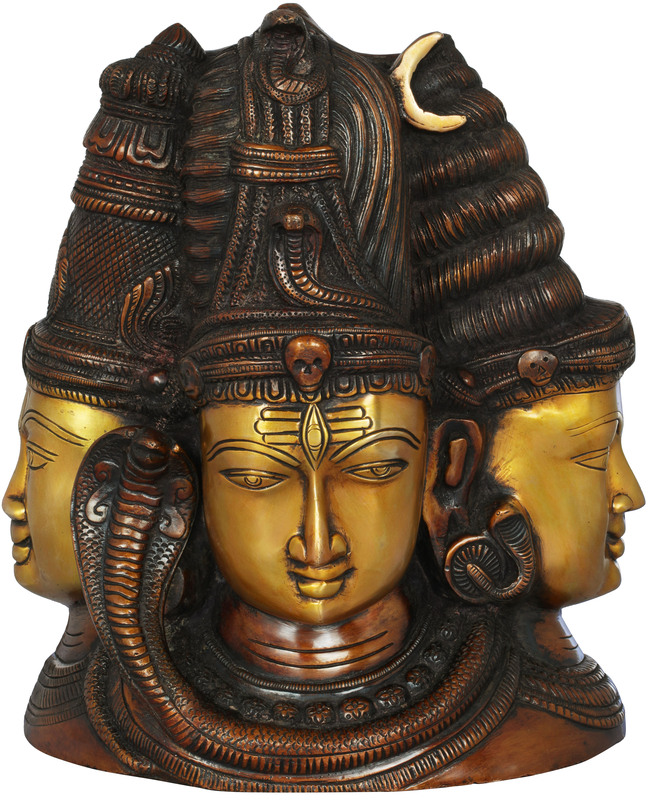 The head on the right is wearing a richly embellished splendid towering Vaishnava crown. 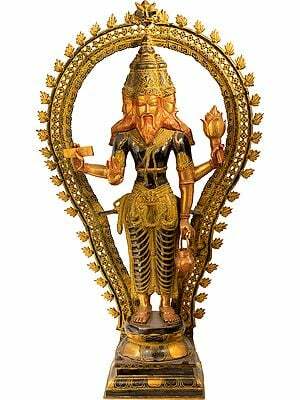 Obviously it has Vaishnava links and is denotative of the face resembling Vishnu. The head on the left has an elegantly dressed ‘jata-mukuta’ as tall as the crown on the right. 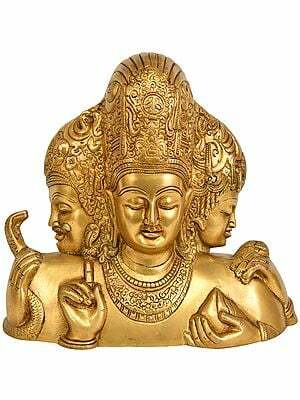 The central head also has an alike towering ‘jata-mukuta’, but unlike that on the left which is simple unadorned the central figure’s ‘jata-mukuta’ has been adorned with laces of pearls and with snakes. Obviously, while that in the centre represents Lord Shiva, that on the left has resemblance of Brahma who presides over and performs ‘yajna’. It is, however, the image of the lotus-holding goddess on the back of the Tri-Murti that registers a complete departure from the regular iconographic form of Tri-Murti. The artist seems to have added the figure seeing in her the primordial source of energy of Tri-Murti, as Sadashiva or as the Great Trinity, a presence preceding them and activating. 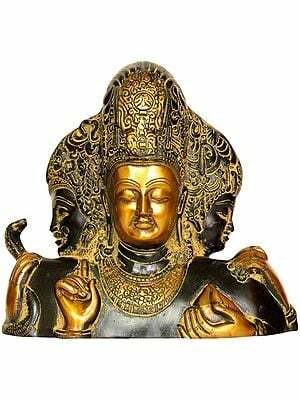 Perhaps not to link her with Lakshmi, the artist used the lotus as symbol of creation, the act to which the goddess put Tri-Murti first.